Time is complicated, more so than space. Yes, it is true that space has more dimensions than time: three values are necessary to pinpoint a location in space (for example, latitude, longitude, and elevation), whereas only one number is needed to mark a moment in time. So in some sense space is more complicated, but what I mean is that it is much harder for the human brain to understand time than space. Consider our fellow vertebrates, with whom we share much of our neural hardware. Vertebrate animals are able to navigate through space, create an internal map of their surroundings, and in a sense, “understand” the concept of space. Animals migrate over large distances with a clear objective as to where in space they are heading; they remember where they stored their food; and even a puppy knows that if a treat falls behind the couch, she can try to circumnavigate the couch and access the treat from the left, right, below, or above. We know that the brains of mammals have a highly sophisticated internal map of space because neuroscientists have been recording from so-called place cells in the hippocampus for over four decades. Place cells are neurons that fire, or “turn on,” when an animal is located in a specific place in a room—that is, a particular point in space. Together, these cells form a network that creates a spatial map of the external world somewhat like a GPS system, except much more flexible; for example, our internal spatial maps seem to be instantly updated when the boundaries of a room are altered or objects are moved about. Animals can not only navigate through space, they can “see” it. Standing upon a mountain, we can see the sky above, the forest below, and a winding river flowing into the ocean—each in its place in space. We can also “hear” space—that is, locate the point in space from where a sound is coming. Our sense of touch (somatosensation) informs us of not only the position and shape of objects, but of the location in space of our most important possessions: our limbs. Time is different. Animals, of course, cannot physically navigate through time. Time is a road without any bifurcations, intersections, exits, or turnarounds. Perhaps for this reason, there was relatively little evolutionary pressure for animals to map, represent, and understand time with the same fluency as space. We will see that animals certainly tell time and anticipate when events will take place, but it seems unlikely that our vertebrate relatives can be said to understand the differences between past, present, and future in the same way that their brain grasps the differences between up, down, left, and right. Our sensory organs do not directly detect the passage of time. Unlike the fictional Tralfamadorians of Kurt Vonnegut’s novel Slaughterhouse- Five, we cannot see across time, taking in the past, present, and future at a single glance. The brains of all animals, humans included, come better equipped to navigate, sense, represent, and understand space than time. Indeed one of the theories of how humans came to understand the concept of time is that the brain co-opted the circuits already in place to represent and understand space. As we will see, this may be one reason all cultures seem to use spatial metaphors to talk about time (it was a long day, I’m looking forward to the eclipse, in hindsight I should not have said that out loud). Time is more complicated than space for scientists as well. Fields of science, like humans, undergo developmental stages: they mature and change as they grow. And in many fields one signature of this maturation process is the progressive embrace of time. … The goal [of this chapter] is not only to understand some of the fundamental insights physics provides about the nature of time, but also to explore where the neuroscience and physics of time intersect—or perhaps I should say where they clash. 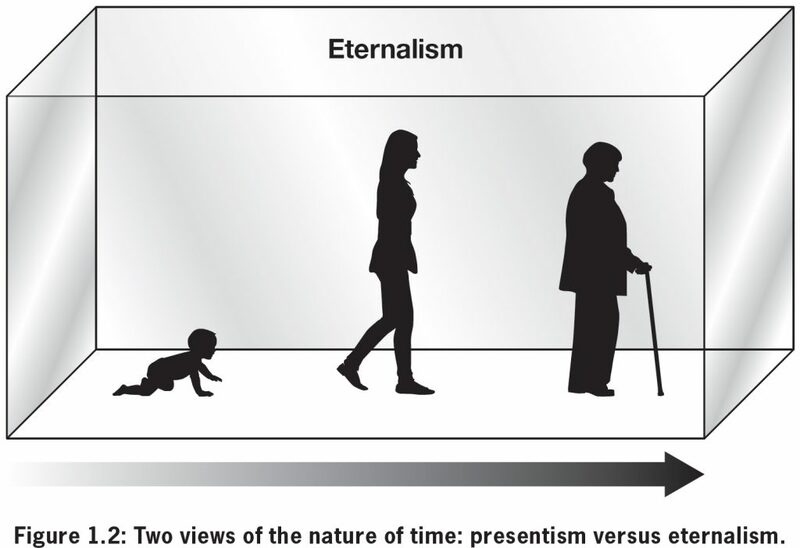 Toward this goal it will be important to introduce the two most important philosophical theories on the nature of time: presentism and eternalism. Presentism, as the name hints, states that only the present is real. Under presentism, the past is a configuration of the universe that once existed, and the future refers to some yet-to-be-determined configuration. Eternalism, in sharp contrast, states that the past and future are as equally real as the present. There is absolutely nothing particularly special about the present: under eternalism now is to time as here is to space. Even though you currently find yourself to be in one point in space, you know that there are many other points in space—different rooms, cities, planets, and galaxies—that are all equally valid places to be in. Similarly, even though you perceive yourself to be in a point in time you call now, there are past and future moments in time in which other beings, and younger and older yous, find themselves (Figure 1.2). Perhaps the simplest way to grasp the distinction between presentism and eternalism is in the context of the topic of time travel. Under presentism, true time travel (jumping back and forth between the past and future) is a nonstarter. Technical considerations, such as whether it is possible to build a time machine or whether the laws of physics allow it, are irrelevant; one simply cannot travel to a time that does not exist any more than one can travel to a place that does not exist. Under eternalism, time is a dimension much (but not exactly) like space, so the universe is a four-dimensional “block”—one in which the past and future are as real as locations north and south of you. 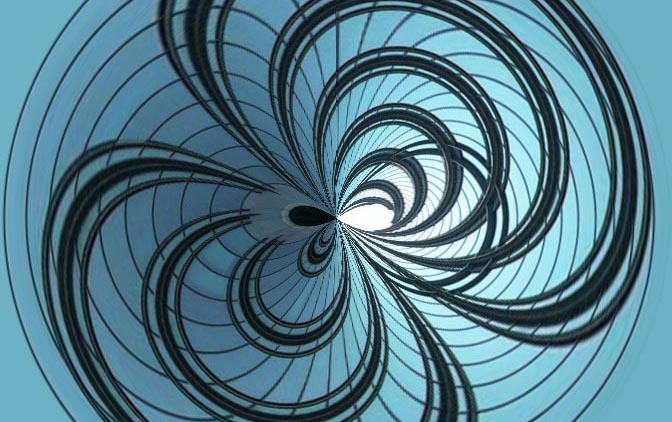 Although eternalism is agnostic as to whether time travel is achievable, it validates the discussion because there would be “places” (moments) in time to travel to. Presentism certainly conforms to our intuition that as each instant of our lives transforms into a past moment, it is gone. Whether or not that moment leaves an imprint in our memory, the moment itself ceases to exist. 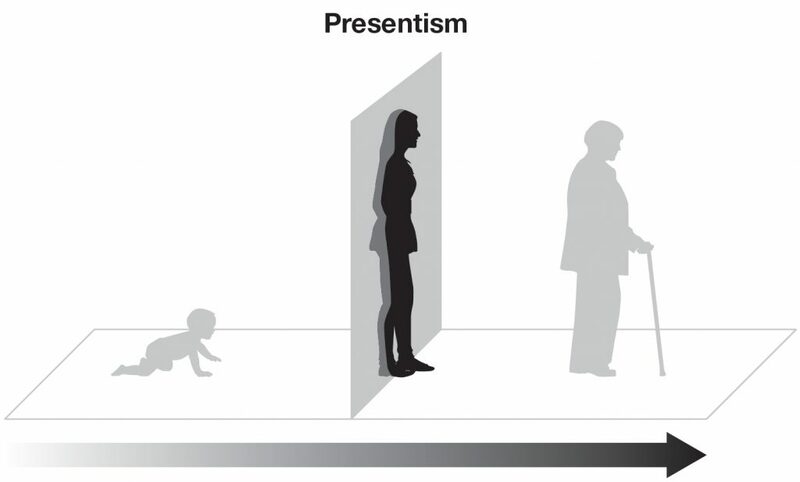 Presentism also corroborates our feeling of control: that our decisions and actions shape an open future. Neuroscientists rarely have to grapple with the issue of presentism versus eternalism. But in practice, neuroscientists are implicitly presentists. They view the past, present, and future as fundamentally distinct, as the brain makes decisions in the present, based on memories of the past, to enhance our well being in the future. But despite its intuitive appeal, presentism is the underdog theory in physics and philosophy. Versions of eternalism go back at least two-and-a-half millennia, to the Greek philosopher Parmenides, who believed we live in a timeless world in which there is no change. Today, for very good reasons, most physicists and philosophers accept the eternalist stance that all of time is in some sense “already” laid out within the block universe. It is not that the notion of time as a fourth dimension is simply a convenient mathematical abstraction—like representing time along the x-axis of a graph—but rather that the past, present, and future truly stand on equal footing. 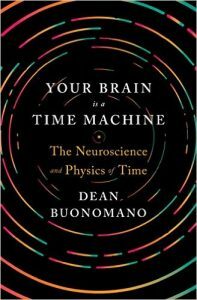 Dean Buonomano is a professor of neurobiology and psychology at UCLA and a leading theorist on the neuroscience of time. He is also a member of the Brain Research Institute and the Integrative Center for Learning and Memory at UCLA. His research has been funded by the National Institutes of Health and the National Science Foundation. His previous book, Brain Bugs: How the Brain’s Flaws Shape Our Lives, was a Wall Street Journal bestseller. He has been interviewed about his research on timing and neural computation for Newsweek, Discover Magazine, Scientific American, Los Angeles Times, New Scientist, and The New Yorker.